Camping solar panels – the season is not over yet! 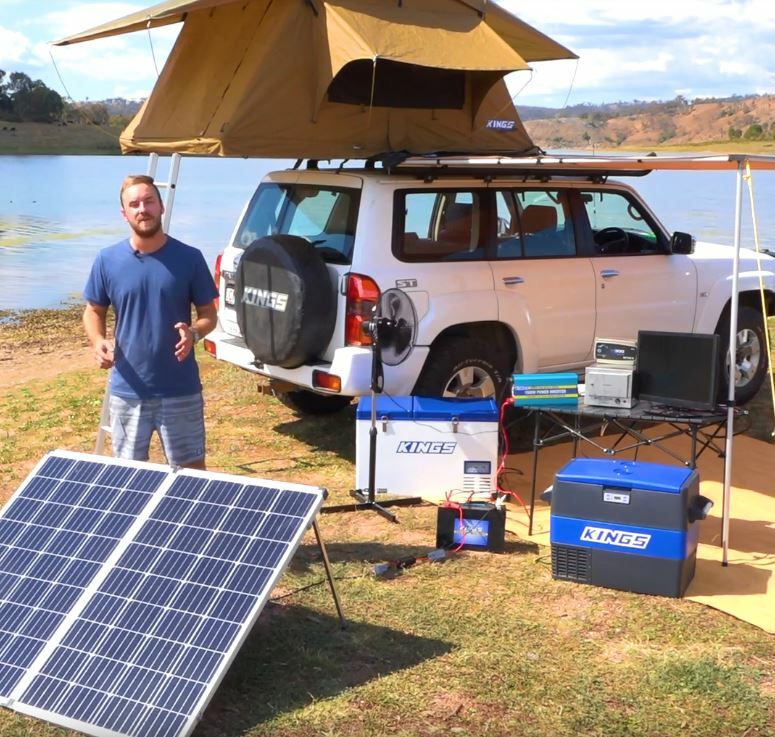 Through the summer months, the Adventure Kings Solar Panel range is in extremely high demand, with the ability to maintain power supply silently and easily for your 4WD’s 12V system, whilst you kick back and enjoy your campsite in peace and quiet. But many people do not realize the absolute versatility and practicality of an Adventure King Solar panel, through the cooler months to maintain charge, and usable voltage for all of your camping accessories. The whole range of Adventure Kings Solar Panels use IP68 waterproof circuitry, and heavy duty wiring to make sure you get the most efficient power transmission from the highly efficient monocrystalline photovoltaic cells. The latest release in the range of solar panels from Adventure Kings, is the updated and more efficient than ever Adventure Kings 250W Solar Panel, being the same unfolded width as the smaller output Adventure Kings 160W Solar panel, and only an additional 340mm tall, you add an additional 90W of output. The Adventure Kings 250W camping solar panel includes a massive 5m lead with waterproof connectors and alligator clips to fasten the panel to your battery, all neatly packed inside a padded heavy duty bag. The folded dimensions of the 250W solar panel are a compact 670mm x 1115mm and only 75mm thick meaning you can pack it easily in the back of your 4WD without taking up all of your cargo space. When setting up your panel the best positioning of the solar panel can yield an even better solar efficiency, so we’ve added an additional length of cable allows you to position it in the best spot to absorb the usable sunlight, build with fully adjustable locking legs, you can position the tilt to be perfectly perpendicular with the angle of the sun no matter how uneven the ground, allowing for even greater efficiency in cloudy conditions or days where sun intensity varies. The Adventure Kings 250W Camping solar panel, outputs a massive 22.3V of open circuit voltage, which is enough to damage your 12v battery system, for this reason, all camping solar panel setups require a voltage regulation system to maintain the correct output for your setup, without causing any damage. The Adventure Kings 250W Camping solar panel, also has a PWM (Pulse Width Modulated) Solar voltage regulator to control the power output, to maintain optimum battery voltage to run your whole campsite. The Pulse width modulator senses the analogue output of the monocrystalline cells and automatically adjusts the output in varying length pulses to adjust and maintain the output voltage to match the requirements of the load on your battery, and enough voltage to charge your battery in the process. With a peak current output of 13.74A, through the summer months depending on your location you can get up to 15 hours of daylight, meaning that your Adventure Kings 250W Camping solar panel offers a blistering 206-amp hours of charging ability. However, all hope is not lost during the winter months, with southern states receiving a little over 9 hours of daylight, this equates to approximately 123-amp hours of charging capacity, which is quite a lot considering the actual amperage used by a typical campsite. With an Adventure Kings 60L Fridge/Freezer drawing approximately 2amps per hour, over a 24 hour period, that is only 48Amps drawn, even on a winter day with limited sunshine, there are 75amps of usable power left for all your remaining 12v accessories, like USB phone chargers, LED camping lights, and much more. The usability of the Adventure Kings Camping solar panel range does not end with the end of summer, all year round versatility, and basically cost free silent power production, your campsite is seriously lacking without the insane value and limitless campsite power setup offered by an Adventure Kings camping solar setup. So if you haven’t already it is time to get your hands on one of the best value 4WD solar camping setups on the market with an Adventure Kings 250W Solar Panel setup!